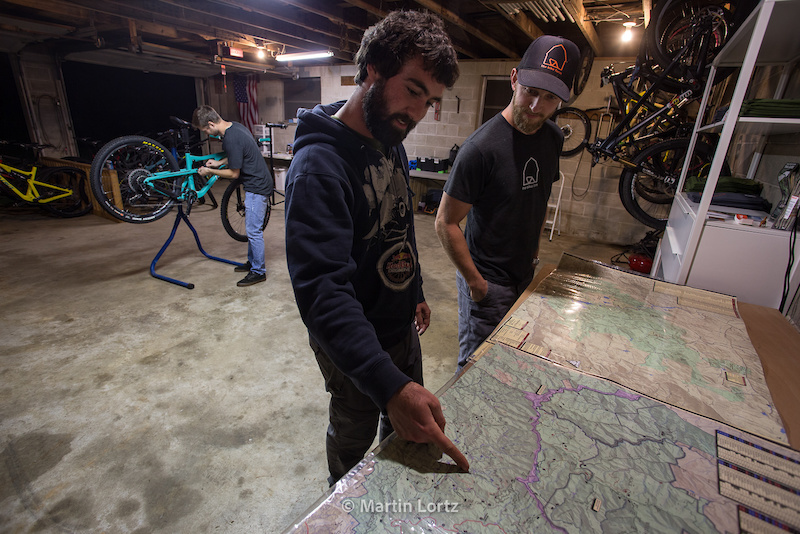 How do you define a mountain bike town? Does it require hundreds of kilometres of trail, mountains to climb, epic scenery, a supportive community? 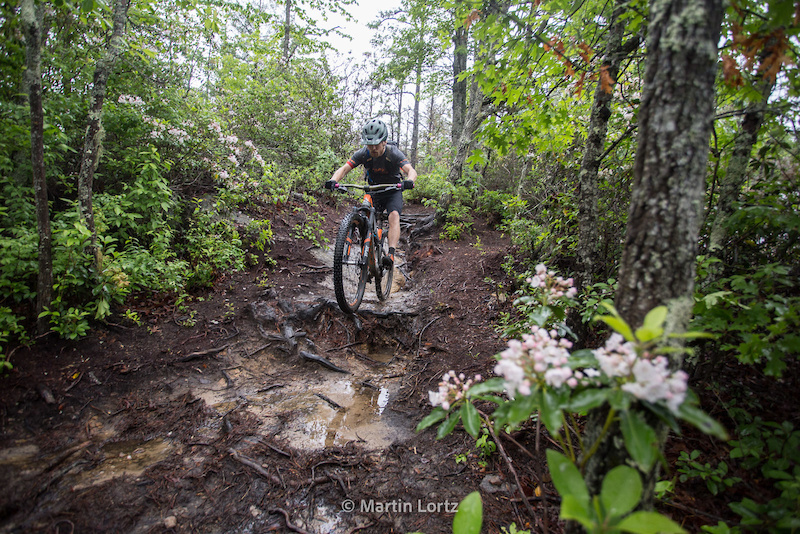 Perhaps making the National Geographic list of the top twenty mountain bike towns in North America would provide the stamp of approval? Well if that’s what it takes, then Brevard, North Carolina is a shoe in. It just so happened that during a recent visit to the area I presented that exact question to a local guide, Barrett, as we pulled up a seat at a local bar, “What makes a mountain bike town?” Before he had a chance to answer the fellow on the seat next to us asked, “How was your ride?” Now we did ride earlier that day but in no means did our attire suggest we partook in such activity (nor did his). No matter, the trail talk quickly spread the full length of the bar. 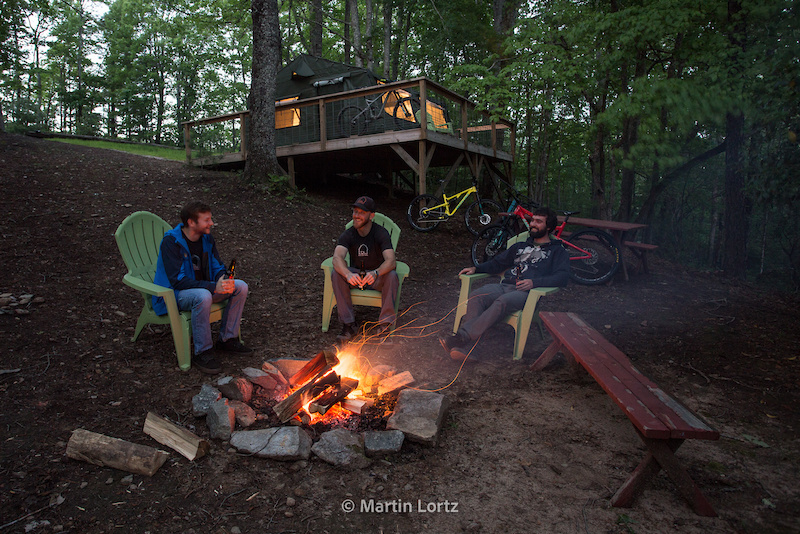 So how do I define a mountain bike town? 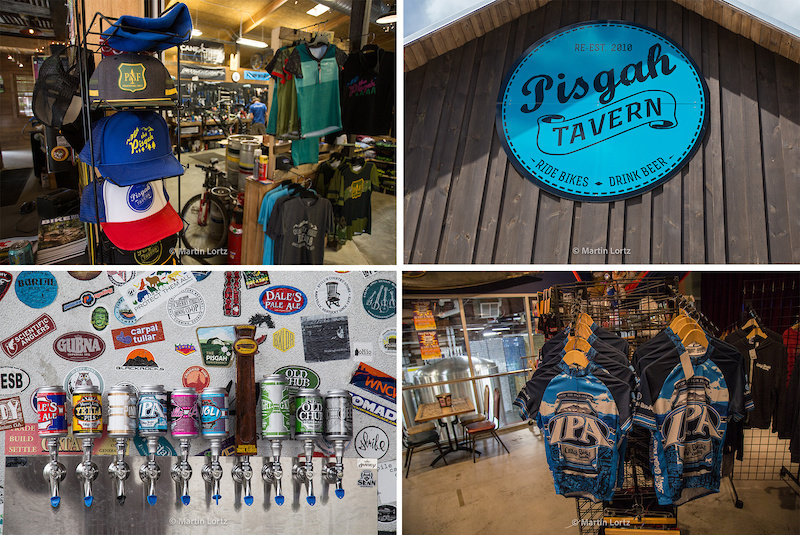 It’s a place where the conversation around a bar, with newly met acquaintances, is dominated not by politics or the weather but by bikes, trails, and rides. 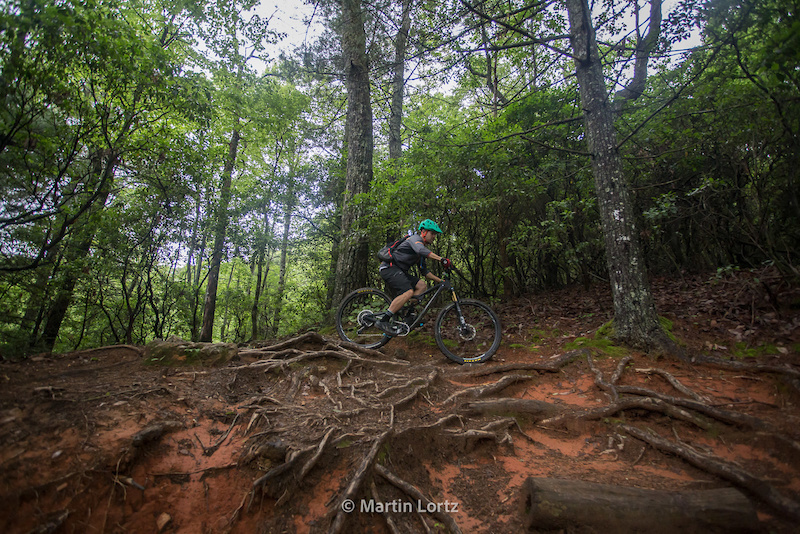 North Carolina as a riding destination is nothing new. Tails of never ending trails trickled in from friends that have visited over the years. That trickle turned into a torrent when I picked up the above pictured Pisgah Photo Book and the wonder wheels were set in motion. With the riding season still thawing out up north of the border, the grass really was greener somewhere else, specifically 1,300 kilometers due south; it was now or never. Rain, rain go away. Damn, you plan your trip weeks in advance then watch with teary eyes as mother nature toys with your emotions. Rain again and not just a sprinkle but waves of downpours that have been soaking the area for the past five days. 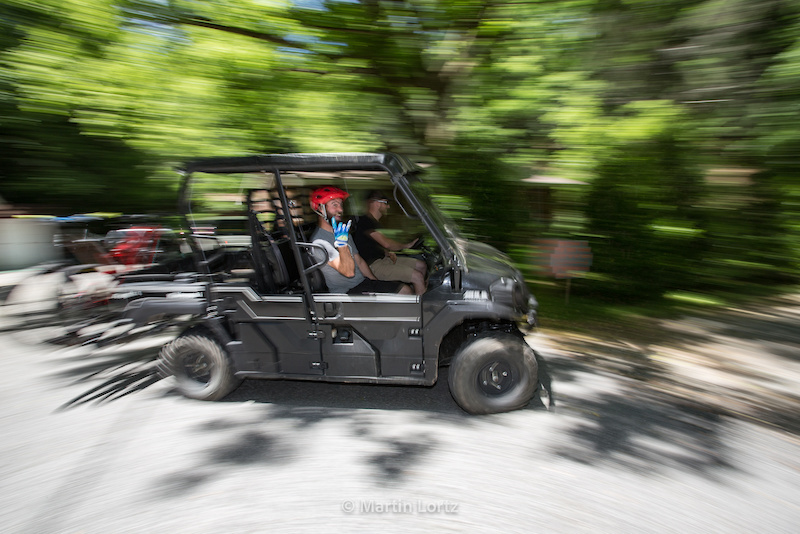 Words of encouragement from guide Barrett from Red Wolf Tours. Why a guide? 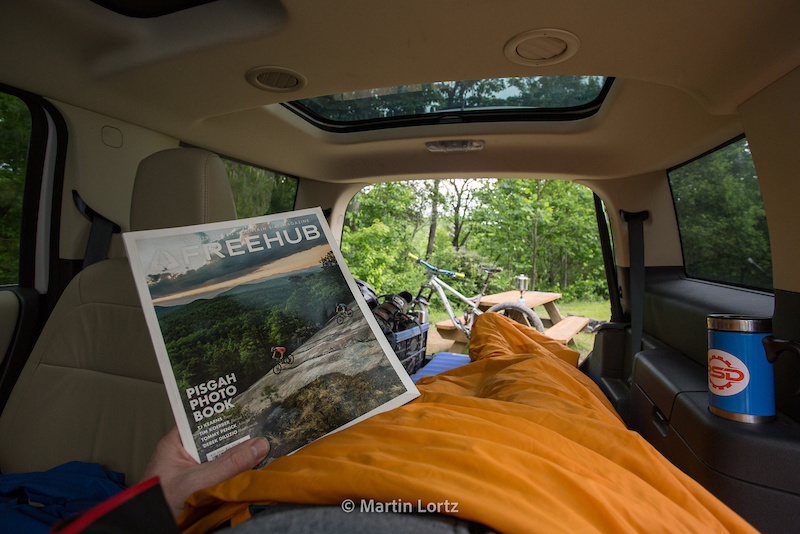 Yes, the area is mapped and there is plenty of good advice from many, but I have only three days to ride and since all the goods seem to be at the end of a one hour plus climb a wrong decision can ruin your day. It's hard to beat local knowledge. 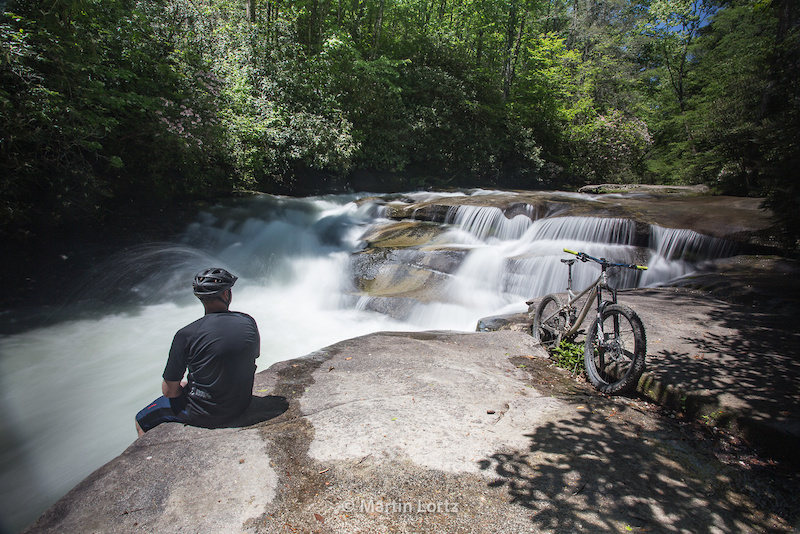 The DuPont Forest is percolating with the sound of running water, but as predicted the rock and sand based trails were awesome. The typically spectacular view from the Big Rock lookout is obscured by mist but the slabs of granite, blooming flowers, tunnels of rhododendron and of course a constant supply of roots and rocks kept things interesting. 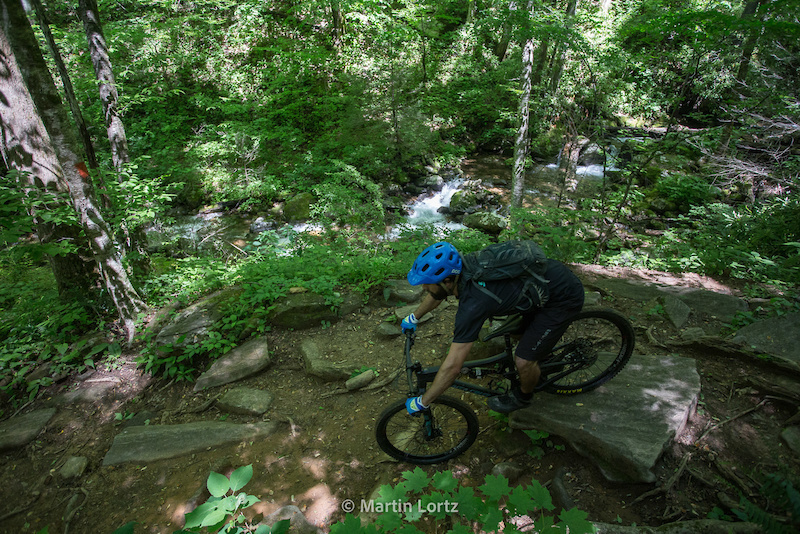 Lap number two is all about the Ridgeline Trail, the flow berm jewel of the DuPond Forest. As they say, all good things come to those who climb; yep, uphill about an hour but the effort is well worth it. Unfortunately, no photos to prove it, way too much fun to stop and the rain is roaring. Still grey above but the rain is holding off. Today I’m joined by Barrett, Jenna the other half of Red Wolf Tours, and Chad Davis aka Crank Joy, all locals by transplant. 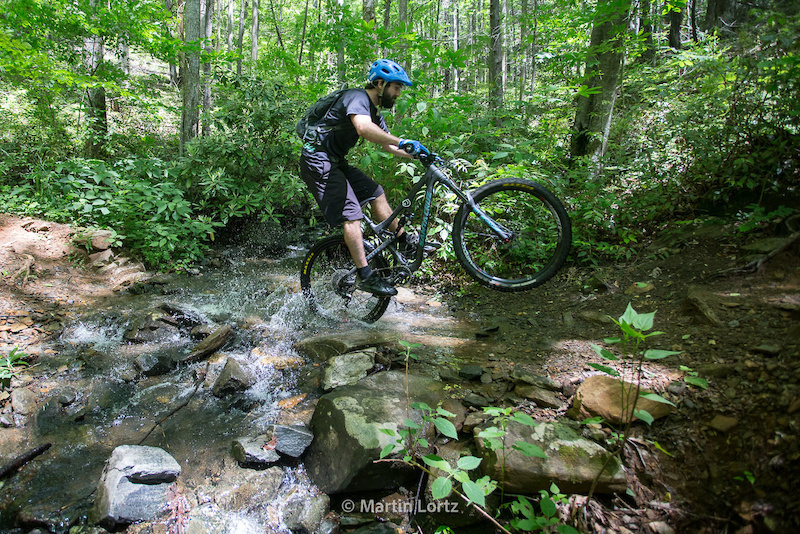 After scouring North America for the best place to ride and live they came to the conclusion that Brevard is the place to be. 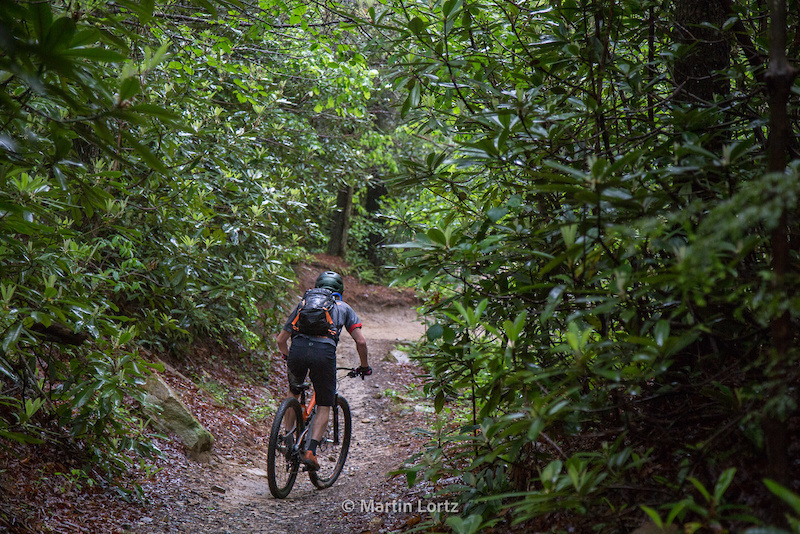 On the morning agenda is the popular Black Mountain loop. Looking at around 17km (10 mi) with 457m (1,500 ft) on the up and then down. I quickly develop an appreciation for the grey sky as a steady drip of sweat rolls off my nose with each pedal stroke, can't imagine this on a hot sunny day! 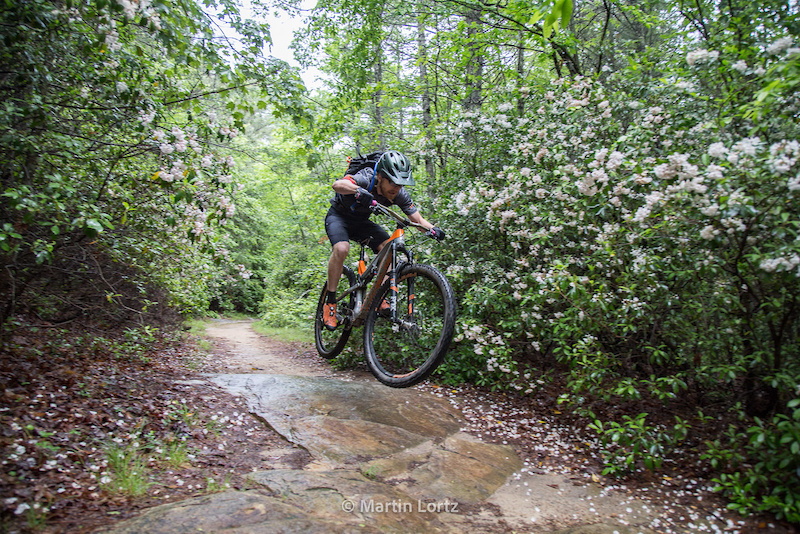 All the uphill suffering is forgotten as we point the bikes down and drop into a typical Pisgah trail experience of root and rock bashing. Half way down things become less bash and more flow with berms and launches accompanied by hoots and hollers. Good times. 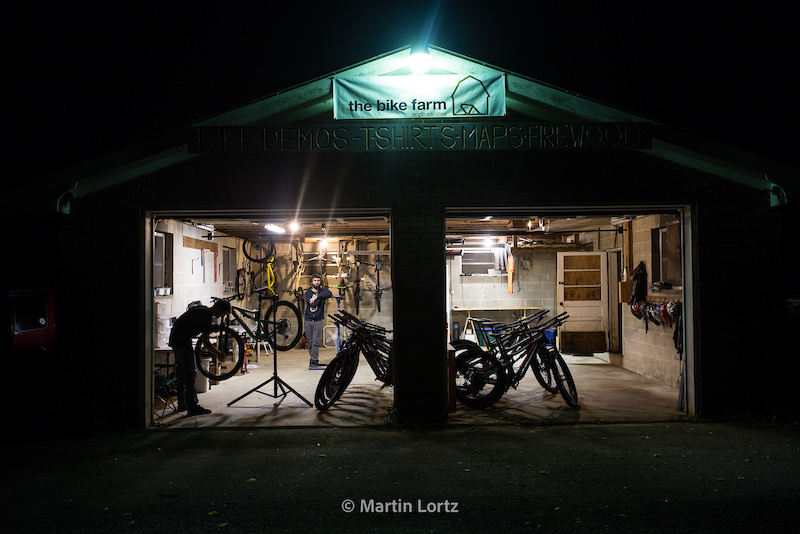 During my accommodation research, all fingers pointed to The Bike Farm as the place to stay. Who am I to argue with all those pointing fingers; fortunately the fingers were correct, this place is awesome. 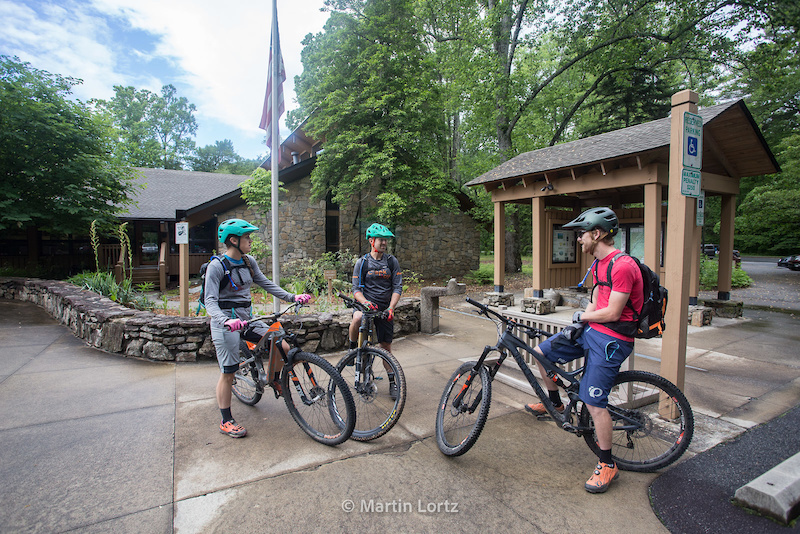 By mountain bikers for mountain bikers, everyone who works here rides, guides, builds trails and teaches skills, and as for the clientele all are welcome and typically there are as many bikes as people. All I required was a car camping spot but you can choose from walk-in camping sites or step up to a glamping treat. 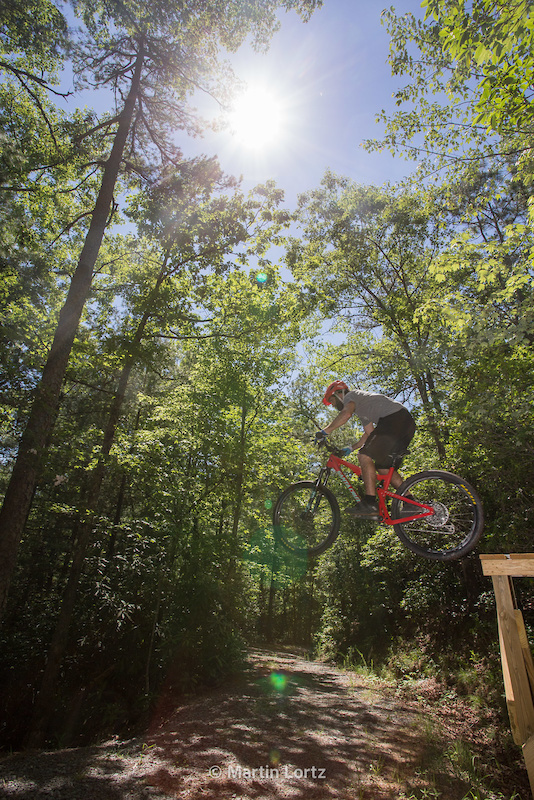 If you’re lucky enough to be staying at the farm on Wednesday’s you can partake in the weekly ritual of hot dogs on the BBQ and shuttle runs on the Goat Fish, a private downhill trail which might just be the only place in the area where you can enjoy some loam turns. 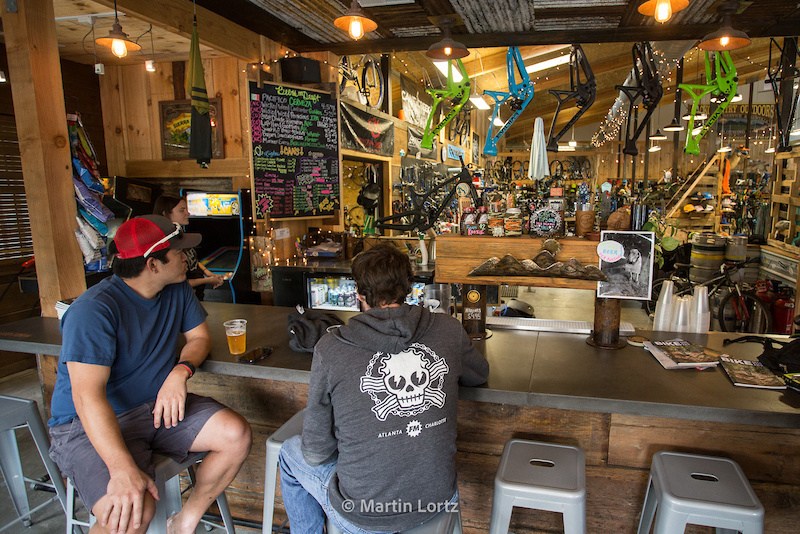 Ride bikes—drink beer is a thing here. Not many will argue with the sensibility of such a catchphrase in an area where the beer industry supports cycling and bike shops sell beer. It took no time to establish my daily routine. First stop the Sunshine Cafe, this unimposing hole in the wall establishment serves up a wicked breakfast menu. Its popularity is reflected in the lack of empty seats. We hit the trails by 10am and finish up at the Hub bike shop in the afternoon. 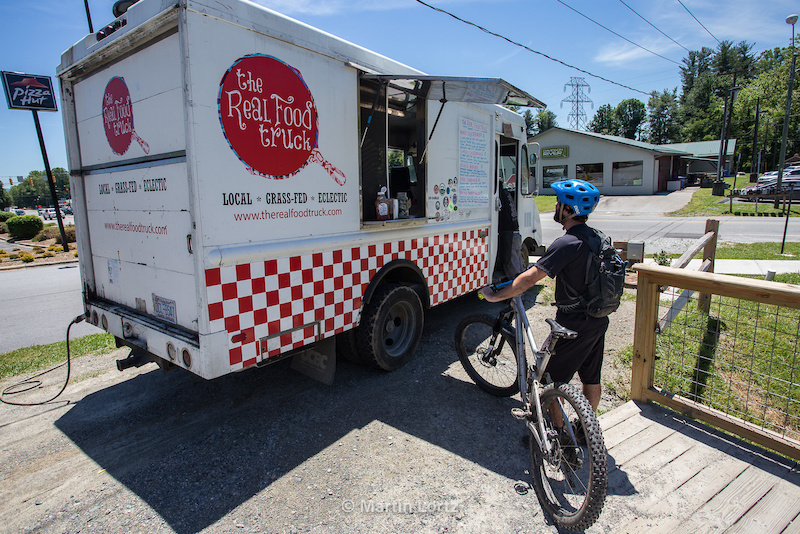 Grab a burger from the onsite food truck and a pint from the bike shop bar. Poke around town, tourist like, then back to the farm for a campfire and you guessed it another beer or two. Ride Bikes—Drink Beer, makes sense to me. Show me the waterfalls. Not an unreasonable request considering the area is known as the Land of Waterfalls. But hey, it’s not all about sight seeing, there better be a good ride in there somewhere. Josh Moore, one of the guides from The Bike Farm took up the challenge and I must say he succeeded. 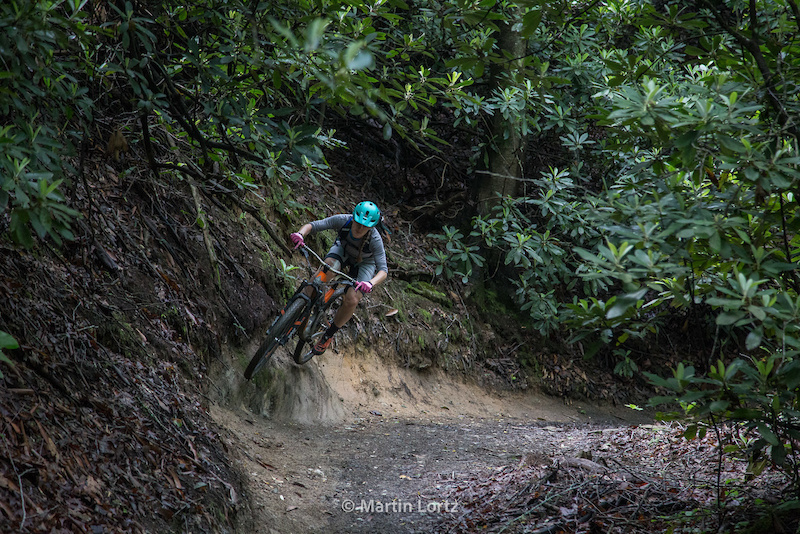 We started off with the mandatory up, bagged a handful of waterfalls and were rewarded with a blast down the Daniel Ridge trail an old school, roots, rocks and arm pump kinda trail with not one man made berm in sight. All along the way the sound of rushing water never far away. That’s it, time flies when you're having fun. 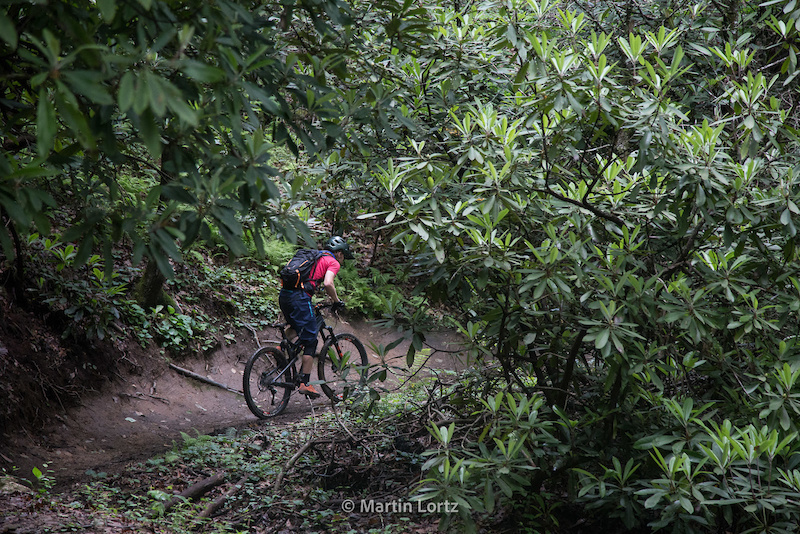 Three days is just enough time to scratch the surface of the area’s mountain biking potential. As my new friends realized if you want to see it all you might as well move here. 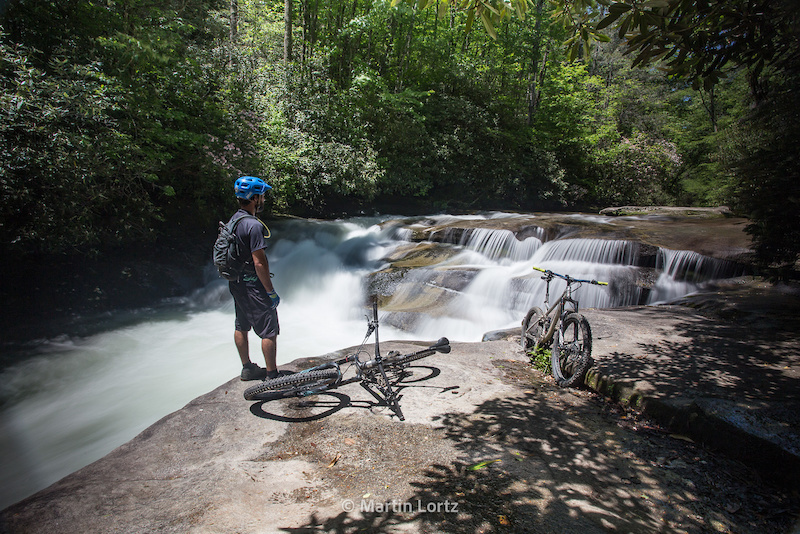 As mountain bike towns go, Brevard has it all, hundreds of kilometres of trail, mountains to climb, epic scenery and a supportive community and yes it did make the National Geographic list of the top twenty mountain bike towns in North America. But most importantly, the stranger on the bar stool beside you will be happy to tell you all about it. Special thanks to RSD Bikes, Red Wolf Tours and The Bike Farm for the assistance in making this adventure happen. We move there next month! So stoked! We've spent the last 18 months traveling & figuring out where to settle down to raise our family. Livin the good life! Can't wait! Ha, best possible comment for Father's Day - congrats! Are you folks cool with guided tours held on wet days like this? I am not. @ShreddieMercury: what is there that is not "cool" about guided tours on on days like pictured above? I don't see why anyone would have a problem with it, why do you? 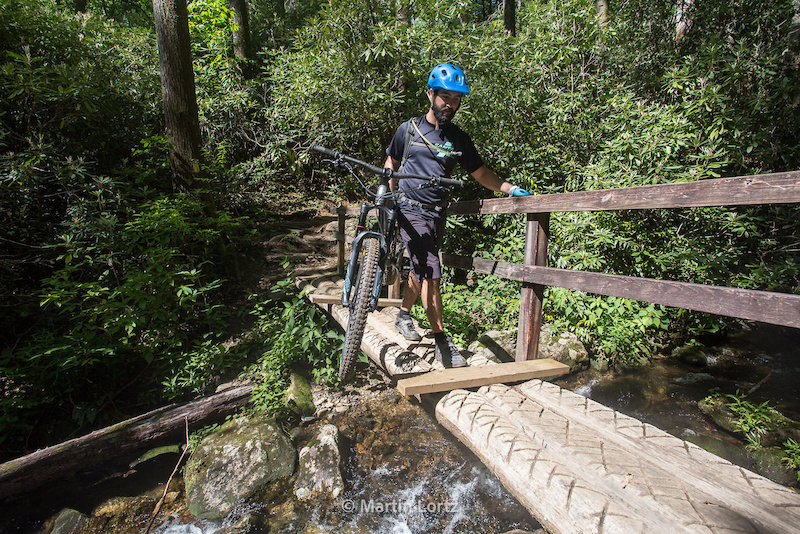 @Singletrackmac: Because they are not taking folks out who ride here regularly. These trails are being f*cked by out of towners who skid, walk, slide and wreck in the DRY. They should not be taking people out when it's raining except on gravel roads. That's why. When you travel a long way to ride and it rains, either you ride in wet conditions or don't ride at all. If anyone is justified in riding in the rain, it is tourists. I've built an extensive trail network near where I live. 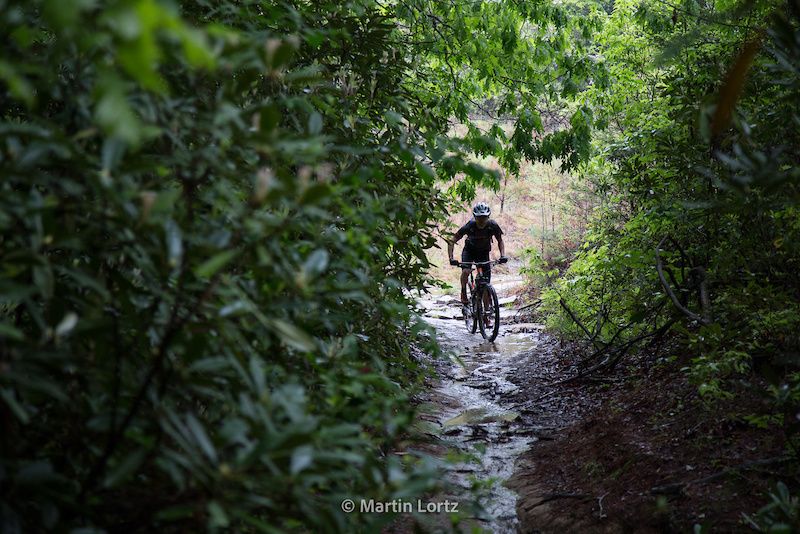 Hundreds of hours of digging later, I still enjoy taking visitors out on the trails... even when it is raining. Local guys? I say let's do some urban and wait a couple days. You do realize that much of this area is a temperate rain forest. It has always been ridden wet and is part of riding this area. @Orangeoveralls: Nope, I just got my first bike last week. Stop writing about Pisgah! Don't go, it's awful! Stay out west riding chaparrals. Ha! Yep. Nothing to see here. Move along. Knocked it off the list last summer -- overwhelming amount of trails, I'd definitely get info from the local shops. Some of the best natural loops, can be very technical, stunning scenery and there are indeed swimming holes everywhere. The vibe in the whole area is spot on. I spent 3 consecutive years road trippin' the 17 hours to Pisgah/Brevard, during the month of April, for a week of riding/camping and some nightlife in Asheville. Met a gal who loved mountain biking, showed me around a bit, and saw Tom Morello play in Ashville; two sets of "the nightwatchman" and wrapped it up with a set of Rage. So many fond memories...thank you Pisgah! Going in less than 4 weeks. Stay for a month and you still won't be able to ride everything. Super cool to see Jenna and Barrett here. Great people that really rip and are down to earth. Word of advice: Don't try to keep up with Jenna on the climbs. She's an animal on the pedals and has serious bike skills! Should plan around Mountain Song second weekend in Sept. 3 days of great music hosted by the Steep Canyon Rangers and all proceeds go to benefit the local Boys and Girls Club. Dupont + Oskar Blues + SCR = Holy Trinity. Went to Brevard over Christmas this year. Epic. Honestly, some of the friendliest bike shops I've ever visited. 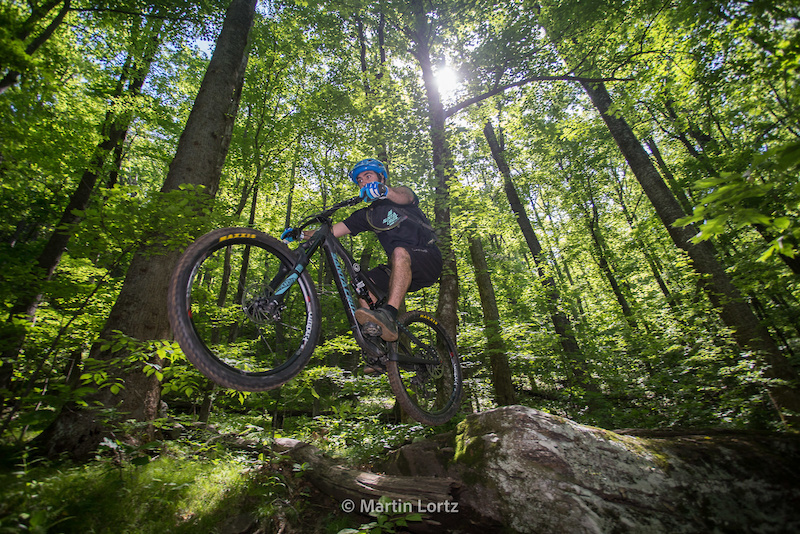 The trails are off the hook. I can't wait to go back. Loved it there, great riding, friendly folks. not nearly as bad in the mountains! I'm Lucky, I live here, ride these trails every week, truly blessed and the Hub has great beer too. One week in this area is never enough. I recommend a 30 day tour. Brings back fond memories. Love that area. Limitless. Place is awesome, went there 2 years ago and we had a great time! Dadgumm coyotes! Stay off my lawn! aw..our home state & what she has to offer! I love these articles. More in this vein please. Cool story. You must've been there the same week I was; when it rained something like 11-12 inches in four days. I'd planned my trip from Phoenix for months and was pretty bummed about the weather. I only managed two rides (Daniel Ridge and Black Mountain), but they were fun. Neat place, not the level of tech I'm used to in Phoenix, but still great trails. Probably too much rain overall for me, though. You didn't ride any of the tech trails there. 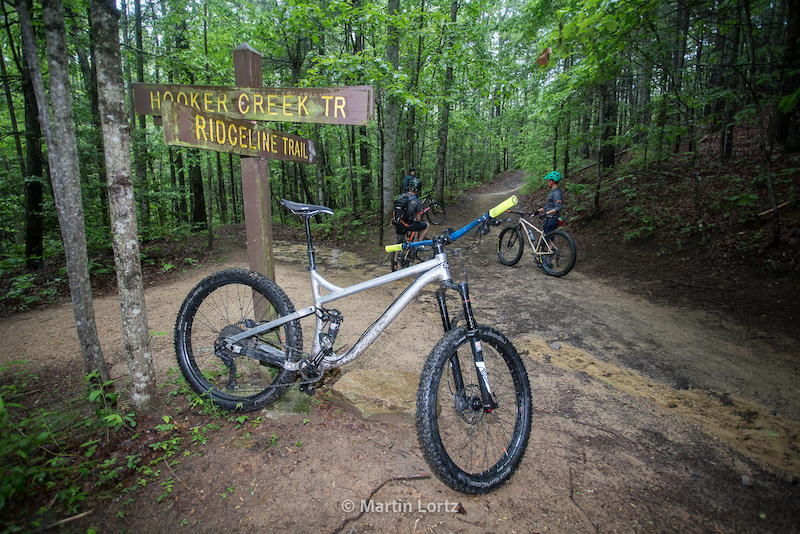 You pretty much went on the beginners loop far as pisgah goes. Sorry you came that week. I cut my teeth on a lot of the dry tech trails in southern California and Arizona. 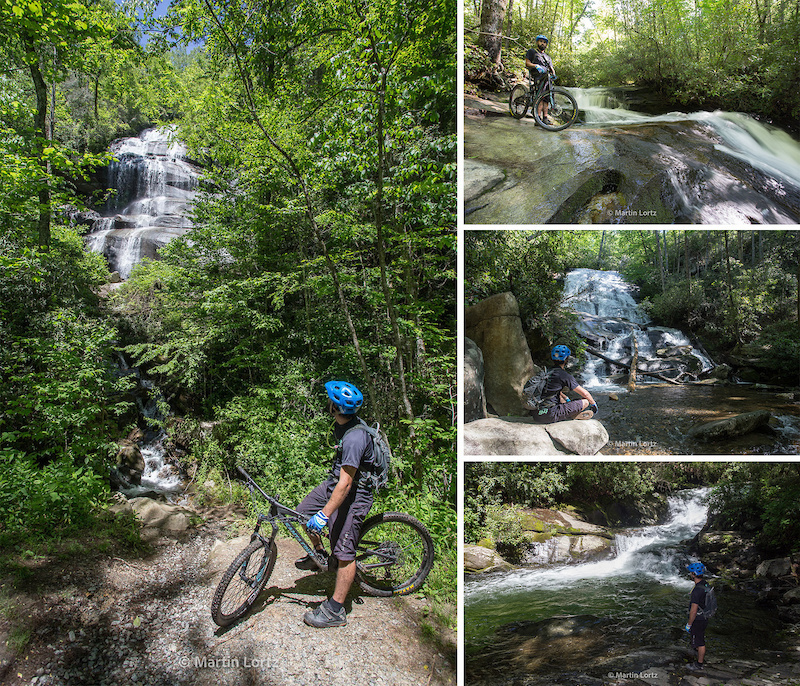 The Pisgah trails are the real deal. No crazy altitude but the trails are great. I live about 2 hours away, have gone regularly, would love to live there. It does rain in that valley a lot. Agree about the overcrowding. I head up that way about once a month and always make sure I finish the ride by 830 or 9, otherwise it's too packed to have fun. 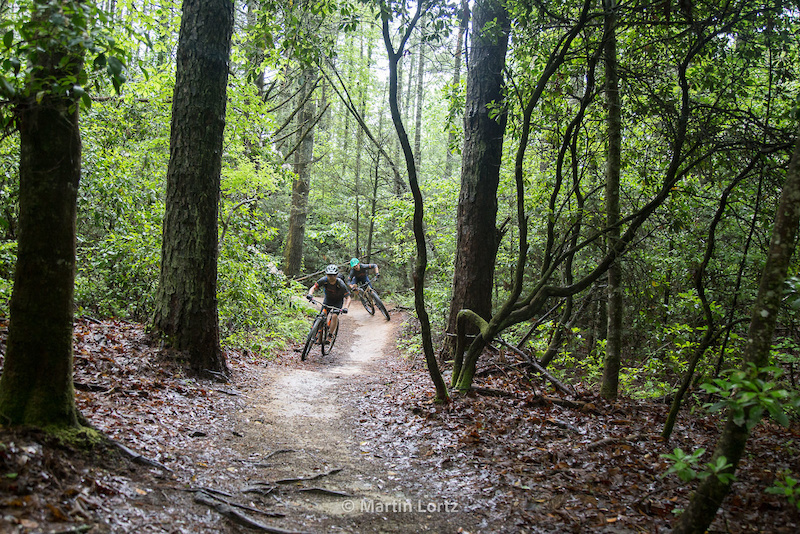 Also, transplants are moving in and destroying the rawness of the trails that made Pisgah great. Look no further than lower Black Mountain, it's absolutely ruined now. IMBA-fied to the max. I'll be relieved when they all move on to the next fad. 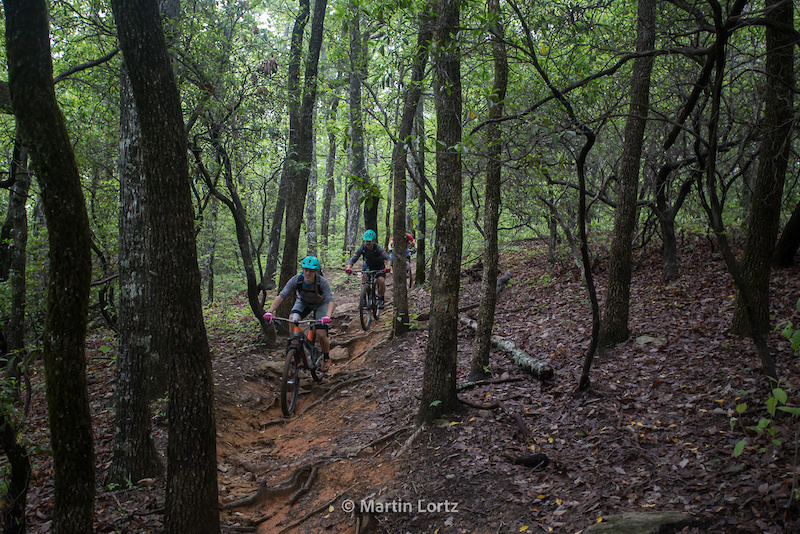 @SangamonTaylor: I bet you can't name a single other trail in Pisgah that has been, as you call it, "IMBA-fied". 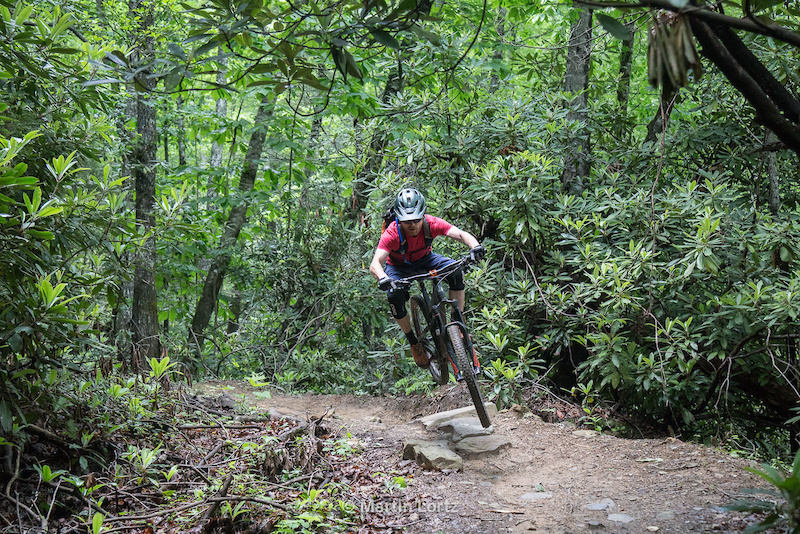 Of the hundred or more miles of trail in Pisgah, you choose to name the two miles that were rebuilt to be a bit flowier. 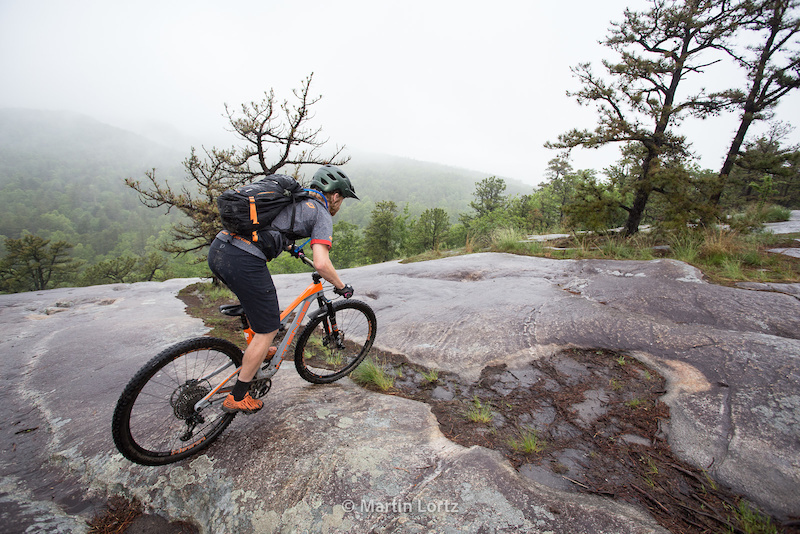 If anything, Pisgah gets more raw and technical every time it rains. I also ride all hours of the day in both Pisgah and DuPont and rarely encounter so much traffic it's a problem. In fact, I can't think of a single instance where I was on a trail and thought it was too busy. The parking lot maybe.